From time to time most collections of cacti and succulents develop problems, related to either pests and diseases or to incorrect cultural conditions. If well cared for, succulent plants should grow well and remain healthy, but this may not be easy when growing plants in a climate which is different from that in their native habitat. Pests and diseases strike large collections of succulent plants in greenhouses and small windowsill collections indiscriminately, irrespective of the experience of the grower. However, a few precautions can reduce the frequency with which the problem occurs. Most pests can be controlled by appropriate treatments, although it is probably fair to say that these problems are never really eliminated from large collections. A number of pests, diseases and cultural problems are described below with some ideas for control measures. Whatever you use, read and carefully follow the instructions supplied with the product and avoid personal contact with insecticides and other chemicals. Please remember that all insecticides, fungicides and some other horticultural chemicals are very toxic to people, and handle with extreme caution - rubber gloves, face mask and goggles are advisable. When new succulent plants are aquired, it is a good idea to keep them separate from the rest of the collection for a few weeks so that obvious pests can be spotted. This allows time for eggs of pests to hatch and the progeny dealt with. A good way to do this is to maintain a "quarantine" window ledge separate from other plants. Many growers repot newly aquired plants into their favourite growing medium, and this is a good occasion to examine the general condition of the roots and check for pests such as root mealy bugs. It may seem over-cautious, but many people like to treat their new plant with systemic insecticide while re-potting. This doubtless helps to avoid introduction of new pests into the collection. Repotting with "sterilised" compost which has been heated sufficiently to kill insects, larvae and eggs is a good idea. A regular check on the condition of your succulent plants, perhaps while you are watering them, will help you to spot the early signs of pests and diseases which are best treated early before serious damage is done to the plants, or before they can spread through the collection. However, never assume that just one plant in a collection is affected. Pests may well have spread to other specimens nearby, even if you can not see them. Ants "farm" mealy bugs for their honeydew secretions and may help to spread them through the collection. Also watch how well individual plants are growing. Poor growth, a sudden change in condition or a limp plant which fails to take up water can be a warning sign of damaged roots caused by e.g. root mealy bugs, vine weevil, or roots rotting as a result of over-watering. Cleanliness in the greenhouse is an important measure in preventing outbreaks of pests and diseases. Always remove dead leaves and flowers as soon as possible. Some growers like to remove flower stalks of e.g. Adromischus before they flower and drip nectar on the plants, potentiating moulds. Leaf litter provides an ideal hiding place for pests. If wet by watering, dead plant material is a breeding ground for fungi and production of their spores. Tidy up debris in the green house left from re-potting and propagation. Treatment of the ground under the staging, walkways and areas of paving with a disinfectant solution e.g. Jeyes Fluid is a smelly but effective traditional way of discouraging pests and diseases. 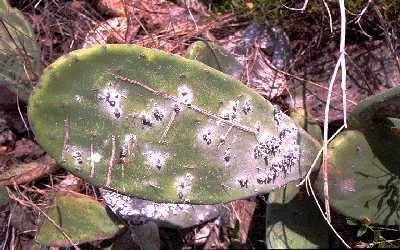 Above: Mealy bugs on an Opuntia Pad in Madeira. These are a very common pest of cacti and succulents, and potentially a huge topic ! There are many species of mealy bugs, but these insects are all small and hard to identify by amateur growers. Their host-plant range and individual sensitivity to control measures are poorly characterised anyway. 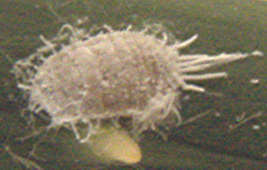 There are probably several species of mealy bug going around collections in the UK and elsewhere. From time to time one certainly sees mealy bugs which "look different". These insects are small and grey or light brown and so difficult to see among the spines of cacti. Their general appearance is reminiscent of tiny woodlice about 2-3 mm long. A squashed mealy bug often leaves a characteristic red stain: the cochineal insect, from which a food colourant is made, is a type of mealy bug. Recently, a species that leaves a green stain has appeared in the UK. Mealy bugs often accumulate to feed on the tender tissues at or near the growing point. Very often, when nesting, they hide around the base of succulent plants, just below soil level or under the old dried leaves of Mesembs such as Lithops. The first sign of a problem is often small balls of white fluff on the plant, on cactus spines or around the base or under the rim of pots. These are where the females are nesting up inside the fluff and producing young, which may be either born live or produced from eggs. There may also be some sugary honeydew produced by feeding mealy bugs, which can encourage black mould. Ants "farm" mealy bugs for their honeydew secretions and may help to spread them through the collection, so it is a good idea to discourage invasive ants even though they are not intrinsically harmful to succulent plants. If there are only numbers of mealy bugs to be dealt with, dabbing a little methylated spirit (industrial alcohol, denatured alcohol) will kill them. Some people also spray their plants with methylated spirit diluted at least 1:3 with water. If you try this, remember that the fumes are potentially toxic and flammable and the liquid could harm the epidermis of delicate plants. Small numbers can be removed carefully with a pin, but it is hard to spot them all. For large or widespread infestations, use regular applications (weekly for several weeks) of insecticidal sprays (read the label to find pests controlled, use and precautions). Wash off as many of the mealy bugs as possible with a high pressure water jet from a sprayer, and treat the plant with a contact insecticide such as malathion (not for Crassulaceae) or a systemic insecticide. Watering with Imidacloprid (Provado Vine Weevil Killer) seems to be very effective against mealy bugs and has not so far shown any sign of toxicity to a wide range of succulent plants. Some fumigant smoke cones are also effective against mealy bugs, and have the advantage of being a dry treatment, but require repeated use to be really effective. Give the cone a good shake before igniting to reduce the risk of poor burning, place on a non-flammable surface and retire promptly after lighting the blue touch-paper fuse, before smoke emission begins. I like to do a preventative fumigation in the Spring and Autumn when it is too cold to spray or water the plants with systemic insecticide, but it is getting hard to find effective types of smoke cone in the UK. Introduce the predator Cryptolaemus montrouzeri, which requires temperatures of at least 70°F (21°C). It is difficult to obtain a predator/prey balance that allows long-term protection in a small collection. Field mice may enter glasshouses in the autumn looking for somewhere warm to spend the winter, or at other times in the course of foraging. Mice tend to take a bite out of a lot of potential foodstuffs, rather than eating a lot of one food, and tend to subsequently avoid foods that were unpalatable or harmful to them. Consequently, a mouse may be very destructive to many plants in a short time, especially choice or show specimens which they seem to target carefully. Another huge topic. Briefly, mice can be trapped live using special live-traps placed near walls, and the mouse released at a great distance from the house. If you do this, inspect the traps often and put a piece of carrot in the trap to provide moisture, or the mouse may die of dehydration before you find it. Alternatively, there are conventional traps which kill the mouse and a range of poisonous baits on sale in most good hardware shops. A cat is also said to be an effective biological control for mice. You could also try putting balls of cotton wool impregnated with peppermint oil around your growing area. This interferes with their sense of smell and may discourage mice from the immediate area but the oil must be replaced frequently. Rats are really a matter for professional exterminators, but a range of poisonous baits are available to control them. The mites are exceedingly small and a strong magnifying glass is needed to see them clearly. An early sign of their presence is the appearance of brown dots where the plant epidermis has been damaged, merging into confluent scarring and sometimes webbing on the plants. The harmful microscopic red spider mites, which damage plants, should not be confused with a commonly seen, much larger red mite 2-3 mm across which is a harmless predator. The reddish-brown mites thrive in hot dry conditions and dislike humid conditions, so overhead watering and spraying plants may discourage mite attack. They are affected to some extent by insecticides (check labels), but a miticide is really needed to control them properly. Unfortunately, effective miticides are not available to amateurs. A predator Phytoseiulus persimilis is available but requires temperatures over at least 70°F (21°C). It is difficult to obtain a predator/prey balance that allows long-term protection in a small collection. An Eriophyid mite Eriophyes aloinis causes severe damage and galling to some species of Aloe. Other members of the Aloaceae may also be at risk. The vermiform mites are microscopic and spread mainly by the wind or by contact. The infestation causes irregular uncontrolled growth on the leaves and inflorescence, not unlike a vegetable cancer with many finger-like projections. The growths are dependant on the mites, which secrete a growth hormone-like substance to induce a protective gall. Although the damage is not reversible, it will not progress if the mites are removed with a miticide. For frost hardy Aloes, exposure to freezing temperatures will kill the mites. However quarantine of new plants, good hygiene and disposal of infected material or whole plants is the most effective solution to prevent the disease from spreading. These insects have the appearance of flat or slightly mounded waxy, brown scales on leaves and stems. The insect under the protective scale feeds on the plant sap and can transmit virus diseases between plants. A sugary honeydew may be produced and encourages black mould. Scale insects do not seem to be common in the UK, but appear from time to time, particularly on plants put outside for the summer. 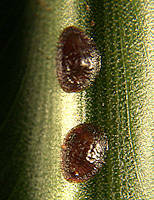 Aloe scales are flat, oval scale insects with white or reddish-brown coverings depending on the species. Use regular applications (weekly for several weeks) of systemic insecticidal sprays (read the label to find pests controlled, method of use and precautions). While these are less traditional pests of succulent plants, they can be extremely destructive if they get into a collection. Although unlikely to invade the house, beware of carrying them indoors on the sides of a pot or hidden under a plant. Snails find easy access to greenhouses and cold frames via vents, cracks in the structure and doors left open. 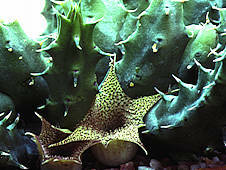 The fleshy succulents are an obvious target for snails, but they even seem to be able to cope with spiny cacti. 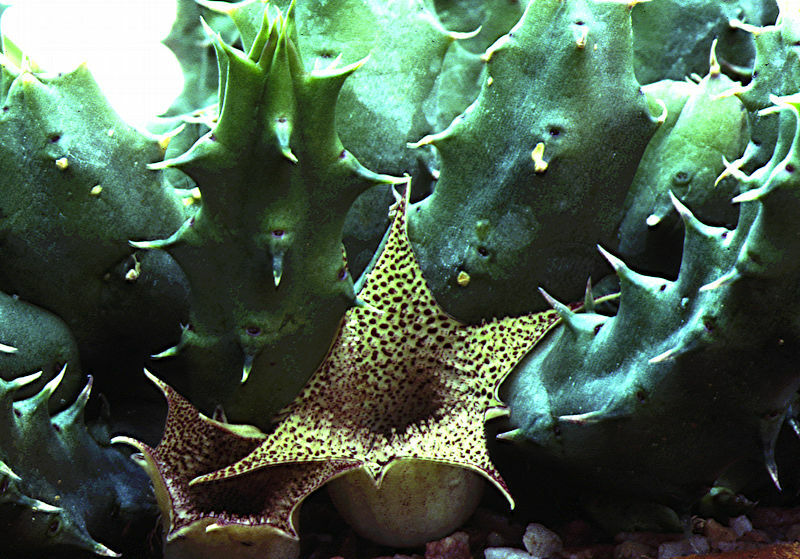 Having dealt with the spines, they relish scooping large chunks of tissue out of the plant body. Generally, careful inspection will allow the culprits to be picked off plants and pots by hand. If you dislike killing these handsome creatures, they must be removed to a distance of at least 200 yards or, being territorial animals, they may return. If hand picking fails, a range of pelleted molluscicides are available which can be sprinkled between the pots and are very effective. These tiny black flies are also known as mushroom flies or soil midges and lay their eggs in moist soil. The flies are particularly encouraged by peat-based potting mixtures and most bags of peat-based compost seem to include a starter culture, even when sold as sterilised. The flies probably find their way in through small holes in the bags. The flies are weak fliers and generally cluster around infested plant pots and may rise up if disturbed. The translucent white larvae, up to 1 cm long generally eat dead and decaying vegetable material, but may also continue into living roots and upwards into the stem of succulent plants. The conditions used for seed raising also suit the flies and their larvae which will then destroy the developing seedlings. The most effective remedy is to use soil-based mixtures and avoid peat. This also reduces the incidence of root mealy bug. Contact insecticides containing Pyrethrum or its derivatives are effective against the adults but eliminating the larvae is difficult. Mixing insecticides such as permethrin with the compost may be helpful. Large gray beetle-like insects seen in the late summer lay eggs in the soil which hatch into fat white larvae with brown heads. These eat the roots and up into the base of stems of plants which then collapse suddenly. The adults nibble leaves and the notches left in the leaves are a warning sign of their presence. When repotting, look out for larvae in the potting mix, and replace all the soil if any are seen. Adding gamma benzene hexachloride (avoid inhaling dust) to the potting mix will discourage the larvae. A new insecticide has recently become available for controlling vine weevil for a whole season by mixing with the potting compost. Preparations of nematodes are available which should be watered into the soil and will attack and kill the larvae. The treatment needs to be repeated at regular intervals. Agave Snout Weevil Scyphophorus acupunctatus - a glossy black beetle-like insect with a pointed snout, typically seen in late Spring and early Summer. The adult insects feed on sap from the leaves and may introduce harmful bacteria. However, the real damage is done by their larvae which infest the starchy core and roots of a mature plant leading to wilting leaves and collapse of the plant. The female weevil lays eggs on the base of lower leaves of a plant that is ready to bloom. The consequences for an Agave monoculture, such as for the production of Tequila, can be devastating. It is unlikely that this particular species of weevil will occur outside the native range of Agaves, but other species of weevil can sometimes be seen feeding on leaves. Although Agave Snout Weevil prefer the broader-leaved Agaves, any genera within the Agavaceae e.g. Beschorneria are at risk. Any snout weevils seen around a plant should be killed and a systemic insecticide applied. Prophylactic treatment of an Agave collection within the native range of the weevil with a systemic insecticide may be advisable. Obviously this is impractical if any part of the plant is to be consumed or fermented. Once a plant has collapsed, it is too late for treatment. The infected plant should be removed and burned, along with grubs that can be found. Watering nearby plants with a systemic inecticide may help to control the pest. A common pest of leafy succulents, including some Asclepiadaceae. I seem to get whitefly on my Fockea edulis every year and the leafy Euphorbias are also at risk. People growing fuchsias and cabbages will be familiar with these pests, and it seems likely that greenhouse plants are infected from susceptible species growing in gardens or allotments nearby. Small (2 mm) white flying insects, a little like tiny moths can be seen flying around infested plants and a cloud of these insects rises if the foliage is disturbed. 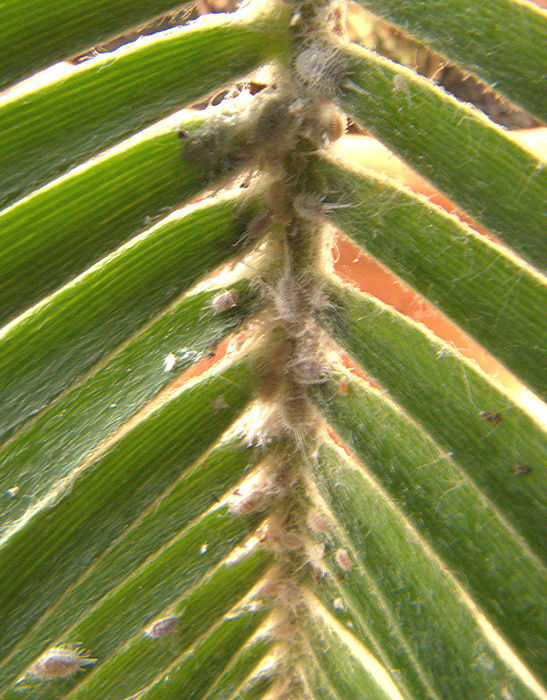 If the under-side of foliage is examined, the immature non-flying nymph stage will be seen.These must be eliminated in addition to the adults to control whitefly. The nymphs secrete a sugary honeydew substance that encourages black mould on plants. Use regular applications (weekly for 4 weeks) of insecticidal sprays (read the label to find pests controlled, use and precautions). A single application will not be sufficient to eliminate all the development stages of these insects. Some smoke cones are also effective against whitefly, but again require repeated use. The parasitic wasp Encarsia formosa can be used to control whitefly in a glasshouse. The wasps lay their eggs in the immature whitefly, which blacken and die, so a supply of whitefly is required to maintain the predator population. It is difficult to obtain a predator/prey balance that allows long-term protection in a small collection. The common greenfly and blackfly seen on garden plants may occasionally invade the greenhouse and start a colony on a leafy succulent. The majority of aphids are female and produce a rapid sucession of live young. In the autumn, males appear and fertilise the females so that eggs can be produced to survive the winter. 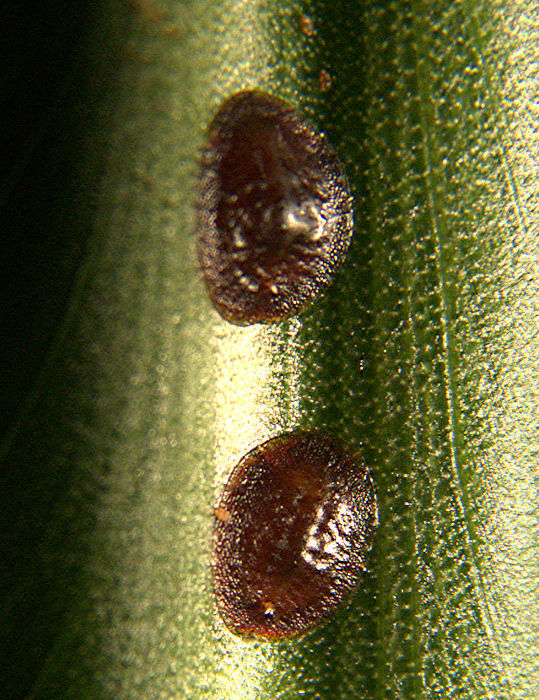 As with other sap feeders, aphids produce honeydew which in turn encourages black mould. Spraying with most insecticides is usually effective. A repeat treatment may be applied after a few days to eliminate any survivors. A range of fungal and bacterial diseases affect succulent plants, some of which can collapse and die very rapidly, once the disease has taken a hold. The world abounds with fungal spores, which are opportunists, waiting for the correct conditions for germination. Generally, fungi do not affect cactus and succulent plant collections because of the relatively dry conditions used by most growers. Damp conditions are a universal requirement for activation of fungal spores, and many of the problems with fungal infection of succulent plants arise from failure of excessive watering or condensation to evaporate, because of unexpected or seasonal cold weather. Damage from insect pests, which penetrate the plant's epidermis to feed on sap, may provide a route for entry of fungi into the nutrient-rich inner tissues. Hence, unexpected collapse of a plant is often the final symptom of a mealy bug infestation which has gone unnoticed. On the other hand, some fungi provide their own mechanisms for penetrating the epidermis. Seedlings are especially susceptible to fungal attack of the lower stem which causes damping off. Once the seedling has wilted, it is usually too late to save it and preventative measure are a better option. is a fungus that causes round brown or black spots on leaves of Aloes and Gasterias. It is of some importance in commercial cultivation of Aloe vera. The black colour is caused by oxidation of phenolic substances in the sap which seals of the affected area. Once formed, the black spots are permanent and can be unsightly, but do not usually spread. Fungi can be discouraged by spraying with a systemic fungicide, but prevention is the best option. Do not allow water to lie on the leaves for long and avoid excess damp in cool weather. Arrange for plenty of air circulation and sunlight. A ubiquitous fungus which is often seen on plants covered with honeydew from whitefly, mealy bugs etc or on plants with nectar-producing glands such as certain Ferocacti. Generally, sooty mould is more unsightly than harmful on otherwise healthy plants. However, it will attack seedlings following mechanical damage or excessively wet conditions and other weak or damaged plants. Cold or damp conditions may lead to rotting of stems, often just around the soil level where damp soil may be in prolonged contact with the plants stem. The rotten tissues may go black or reddish brown depending on the plant and organism attacking it. If the stem is cut well above the rotten part, it may be possible to re-root or graft the healthy tissues and save the plant. Many people support the basal stems of difficult plants with a layer of grit above the potting medium, so that there will be little water retention against the stem in this critical region. A range of brown or gray spots spots on leaves and corky brown marks on stems of are undoubtably due to fungal attack following damage or prolonged contact with drops of water. Others may reflect poor cultural conditions or the natural development of corky or woody stems as the plant matures. In many cases, fungal attack and poor culture are linked. Improving ventilation, temperature control, watering and application of fertiliser may help to prevent all sorts of problems. Growers of Asclepiads will be familiar with black spots developing on the stem which spread and develop into sunken patches of dead tissues. This fungal infection can spread to the whole plant unless the affected part is removed promptly or treated with fungicide. Usually this happens after overal-liberal water, perhaps where water droplets fail to evaporate because of unexpectedly cold conditions. Once a plant has collapsed or the stems have started to become soft and rotten it is often too late to save it. However, an attempt may be made to save part of a valuable plant by cutting away the infected tissues with a clean knife, sterilised with methylated spirits. A wide margin of apparently sound tissue should be removed as the infection will almost certainly have spread further than is apparent. The remainder can be painted or dipped in a systemic fungicide such as Nimrod T or dusted with sulphur and rooted as a cutting or grafted onto a compatible stock. This common cause of early loss of seedlings can be avoided by lightly spraying the potting mix with a systemic fungicide such as Benlate or Nimrod T. Spraying with a copper sulfate solution is a traditional remedy, but copper fungicides may accumulate in the soil with potential copper toxicity to plants. Any seedlings that become infected should be removed promptly before more spores are produced, the remaining seedlings sprayed with fungicide and surface moisture alllowed to evaporate. While these notes focus on pests and diseases of cacti and succulents, incorrect cultural conditions are a major cause of poor growth or loss of house plants in general. The single commonest cultural problem is over-watering, with the roots left wet for excessively long periods resulting in rotting. Other growth problems are related to insufficient light and too low or high a temperature. Most cacti and succulents are expected to flower when they reach the mature size, or even before, and failure to flower may indicate unsatisfactory growing conditions. This is probably the single most common cause of failure of succulent plants to thrive. The plant may appear to do well at first, its leaves plump up and new growth produced. However, the roots may be suffering in wet soil and begin to rot unseen. The plant still looks well as the few remaining roots are able to take up sufficient of the plentiful water. As the roots continue to die in the stagnant soil, a point is reached at which they are unable to supply sufficient water and the plant appears to be suffering from lack of water. If more water is supplied, the situation gets worse and the rot may spread upwards into the basal stems or plant body. Eventually the plant body is observed to be soft and discoloured, perhaps yellow or grayish, by which time it is usually too late to save it. The moral is, that if a plant appears to be failing to take up water, knock it out of its pot and examine the condition of the roots before supplying more water. Other reasons for loss of roots include pest damage and dormancy. Watering a succulent plant at the wrong time of year when it is dormant can cause rotting as effectively as can also happen if the roots have been eaten by insect pests. If unsufficient water is provided for the prevailing temperature and stage in the growth cycle, leafy succulents stop growing and may shed their leaves and the apical tip of stems may die. This is followed by die-back or self-pruning of stems and branches. Cacti may shrink back into the potting mixture and possibly take on a reddish or purple hue because of production of coloured stress pigments. In some cases, shrinkage of a cactus during drought produces irreversible folds in the plant body which never fill out again. However, careful watering usually reverses the effects of drought on succulent plants. Small amounts of water should be given to water-starved plants at first, in case some of the roots have been lost. Natural sunlight is the best way of illuminating your plants, many of which are native to arid hillsides under scorchingly bright sunlight. Succulent plants kept with insufficient light grow with pale or yellow sometimes stunted leaves and elongated relatively thin stems with long spaces between the leaf joints. This is known as etiolation. Cacti become soft and elongated with weak spination. The condition can generally be reversed by providing stronger light, although elongated growth in cacti will always remain as a record of the change in growing conditions. Succulent plants can often be pruned to restore their shape. Cacti and some succulents will not usually become etiolated in dark conditions if kept cool and absolutely dry, and some growers allow their plants to become dormant for winter storage. Scorch can affect succulent plants if there is a sudden period of sunshine after the dark winter days, or even after a prolonged cloudy period during the summer. Sunken brown or white patches develop down one side of a plant where the tissues have effectively been "cooked" and the green chlorophyll destroyed. Sometimes a glasshouse plant loses all its green pigment through excessive heat alone, even though it may not have been in the direct sunlight. Scorching can be avoided by the timely application of shading to the greenhouse, improved ventilation and air circulation within the growing area to even out air temperatures. When moving plants into direct sunlight, or putting them outside for the summer, harden them off gradually in diffuse sunlight or put them under mesh shading for a few days to acclimatise. Although many cacti and succulents are surprisingly cold-hardy if kept absolutely dry during the winter, some species from perpetually tropical climates (e.g. Madagascar) can suffer damage to the soft tissues at their growing points, and scarring and collapse of their stems leading to fungal attack and death of the tissues. The only solution is to maintain higher temperatures for susceptible plants. Some species such as Echincactus grusonii which are otherwise easy to grow, can develop unsightly brown marks which spoil a specimen plant, if temperatures are too low.